This week I wanted to fully immerse myself with The Work, by Byron Katie. I downloaded her audiobook and started listening as much as I can and made notes. The audiobook helped me to understand the framework and by listening to a few example sessions I really felt how negative thoughts can be reversed by plain logic. The process is kind of similar to the 4 question Dane is talking about in for example this SPI 85 podcast and his earlier videos about limiting belief examples and how it affects your identity. The base of the framework is this set of Four Questions. Katie’s version adds 3 preparation questions and 3 finishing questions on her Judge-Your-Neighbor worksheet. The 6 preparation questions help you embrace your judgement without trying to change it. You go deeper into the negative feeling and try to spit it all out. 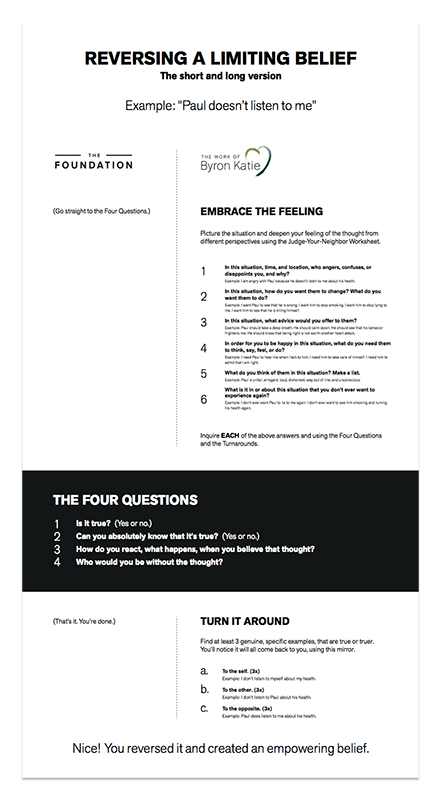 Then for each answer you do the Four Questions to open you up to a possible opposite perspective. At the 3 finishing questions you turn your starting statement around in 3 different ways. This really acts as a mirror, and shows you how everything you call others is actually something you call yourself. The result at the end of the process is a reversed empowering belief. Sometimes instead, you’ll find a deeper negative belief that allows to do the work on a deeper level. Althought I like writing, I don’t really like the Judge-Your-Neighbor worksheet because it is very small and leaves me little room to express myself. I also came across an iPhone and iPad app by Byron Katie herself. You’ll have The Work without at any time, and it allows you to email yourself (or your Evernote email address) the results for later reflection. There are some extra audio and video explanations in there as well. After listening to her audiobook and watching a few of her movies I did see the amazing calming impact both her voice and her apperance have. I guess her face in the app might help people to calm down and know things will be alright. But I prefer a more clean designed app, without looking at Katie’s face all the time. I feel it’s much more empowering to be able to do The Work by ‘yourself’. Because I like to write down as much as possible when answering the questions, I felt both the PDF worksheet and the App didn’t give me the space to do so. I created a simple Google Form of both the Judge-Your-Neighbor worksheet and one with just the Four Questions on it. When answering a question these forms allow me to type, type, type until I feel I’ve expressed everything on my mind. The results go into a Google spreadsheet so I can have a look at them later. For now, no need to look back. The shorter version saves a lot of time and I can successfully reverse a lot of simpler limiting beliefs. However I had the best results with the long version on stronger beliefs that feel like they are strangled together with other beliefs, and sometimes even feel like they have deeper beliefs causing them. Doing the 6 preparation questions helps me to get deeper into the feeling, declutter it, and reverse it with the mirror effect of the 3 turnarounds.